Get to know the bright stars and constellations of each season with the Night Sky Adventure. No background in astronomy needed! A Celestial Treasure Hunt is a book of simple step-by-step introductions to the night sky for each season, using familiar "sign posts" to get you oriented. Making a Family Starfinder allows your family to build its own large format planisphere (star-finding wheel) for more nighttime "treasure" hunting. Who deserves a place in the sky? 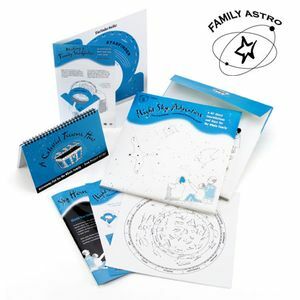 Decide for your own family with Sky Heroes, an erasable placemat designed for you to create your own constellations. Can you learn constellations and bake at the same time? Now you can, with Constellation Cookies, two easy recipes for all to enjoy. This product is also available in a Spanish version. Browse More Family ASTRO Games & Kits above.